Now I finally put to rest my issue with the 2014 Oscar for Best Animated Feature. The Oscar went to Frozen, which in my opinion was the most overrated and overhyped movie of last year. Why did Frozen beat a Miyazaki feature? The voters admitted they didn’t even see The Wind Rises. The Wind Rises (風立ちぬ, kaze tachinu) is a fictionalized biography of Horikoshi Jiro (voiced, interestingly enough, by Anno Hideaki, the Miyazaki protege who went on to direct Neon Genesis Evangelion), the aeronautical engineer who was responsible for designing many of the planes used by the Japanese military in World War 2, notably the Mitsubishi Type 0 Carrier Craft, more commonly known by its Allied designation of Zero. Jiro finds his way in the world, falls in love, and makes his mark on history. The first thing to happen in the movie is a dream Jiro has as a child in which he flies a plane through his town. It goes on for a good few minutes where a word wasn’t spoken. The movie strutted its stuff as far as its animation. As to be expected, the animation is absolutely top-notch. Studio Ghibli seems to be the one animation studio that still makes cel-animated feature films. 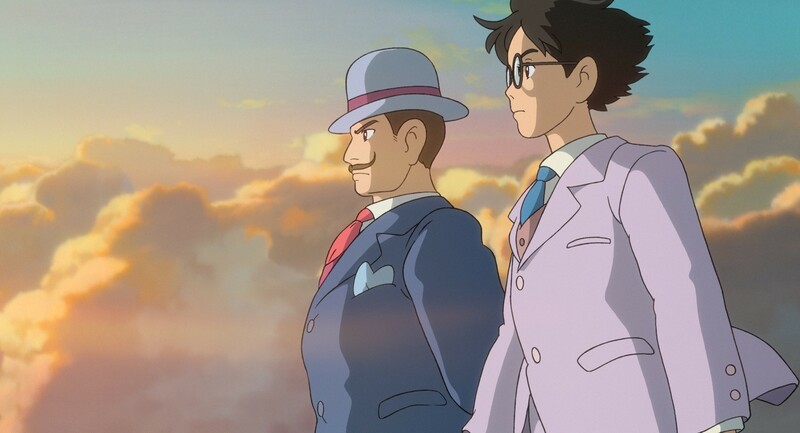 Like many of Ghibli’s recent films, such as From Up on Poppy Hill, The Wind Rises had its animation augmented with computer graphics, but it was otherwise a traditional animation. I wish more studios acknowledged that really only Pixar should be allowed to make CG-animated movies. As we watch the animation, we also get to hear yet another gorgeous score written by Joe Hisaishi. The Wind Rises is a movie that will tug at your heartstrings. The feel of the movie was akin to a more grownup Kiki’s Delivery Service in how minimal the actual plot was. We see an engineer come to age, work, love, and live. Jiro (though much of his personal life was fiction in this movie) was capable of leading a completely interesting life without having to take on a bad guy. While the movie focused on someone who helped build a lot of Japan’s military and gave ominous warnings about the fate of Japan in the war, The Wind Rises generally avoided the subject of World War 2 itself as it took place almost entirely before the Japanese attack on Pearl Harbor. While Ghibli’s own Grave of the Fireflies got really down and dirty on the subject of the war itself, The Wind Rises was much more focused on a man achieving his dreams. In general, The Wind Rises is an extremely poignant animated (fictional) biopic I would recommend to anyone who wants a good animated feature to watch. I wish I knew more before I could make this assertion, but I think Disney, which also owns the rights to distribute Ghibli films in the US, was trying to kill this movie in America because Frozen was their flagship project. If I recall correctly, The Wind Rises never even got a wide US release (even though it was the highest grossing film in Japan in 2013), whereas Frozen was in theaters for far longer than I recall any other movie being shown. On top of that, Frozen got its home video release in March 2014, almost as soon as it got pulled from theaters, whereas The Wind Rises’ US DVD wasn’t published until November. Even then, The Wind Rises was released under Disney’s Touchstone Pictures label, which is generally how Disney’s less family-friendly films get released. While The Wind Rises got nominated for the Oscar, Disney basically set The Wind Rises up to lose it to Frozen. It’s so unfair that The Wind Rises lost to Frozen. There is a world of difference between the two movies, and Frozen doesn’t even come close to the artistic genius that is The Wind Rises. I know everyone has their own opinion, but this particular case shouldn’t even be debatable. My opinion is that the Oscars has ceased to be a credible accolade for movies. Lately, you can see how it’s possible to formulate “Oscar-bait” movies. With last year’s animation Oscars, 4 of the 7 voters flat out abstained from voting, while the remaining 3 picked Frozen because that was the only animated movie they saw.